The Marvel Cinematic Universe initiative has been a massive success for Disney, and the comics giant is allegedly building a similar collective continuity across its games. "You might have noticed that certain similarities and threads touch from one game to the next," said TQ Jefferson, Marvel's VP of games, at a SXSW panel on Saturday. "Much like you see in publishing and film, we're trying to build a gaming universe connected by common elements and narrative into a larger gaming initiative." As I'm sure you know, the Marvel Cinematic Universe had a series of singularly focused films (Iron Man, The Incredible Hulk, Captain America and Thor) as a lead into The Avengers film, which was the biggest non-James Cameron movie ever in terms of raw box office dollars. That was just phase 1, with a second series of films coming out now and leading up to The Avengers 2 next summer. 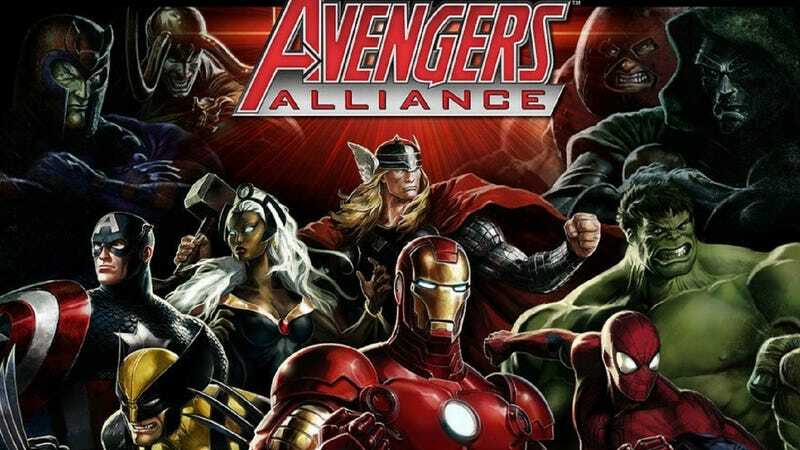 Marvel games already has its mega-teamup game in the free browser/mobile title Avengers Alliance, which will expand this year to include characters from this year's Captain America: The Winter Soldier and Guardians of the Galaxy films. It also has the MMO Marvel Heroes, LEGO Marvel Superheroes, Deadpool and a number of other mobile games. Sony, not Marvel, owns the film rights for Spider-Man, so the game based on The Amazing Spider-Man 2 is in a weird spot.